Using a bow saw cut a section of branch around 1½ to 2 inches in diameter and 8 to 10 inches in length. 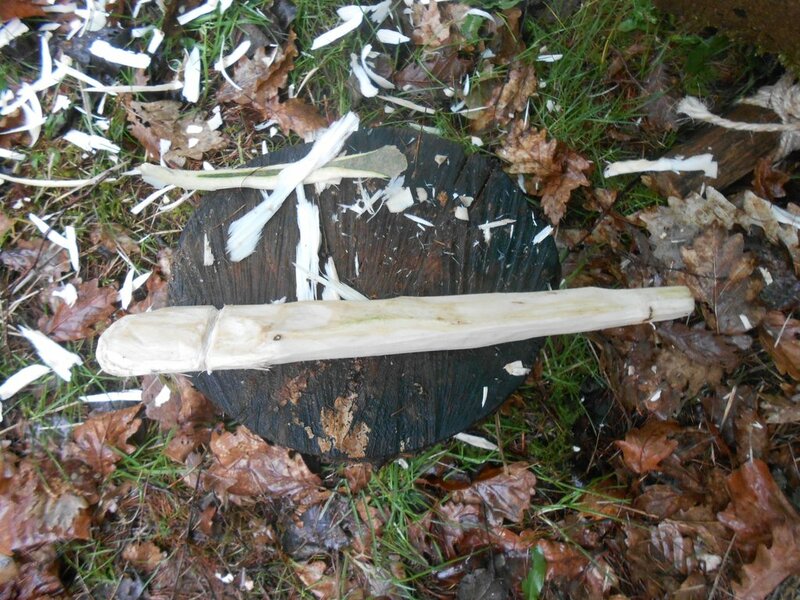 Using a bill hook split the wood in half through the center of the pith. Depending on the diameter of the wood, and what you are going to use the peg for securing, you may want to quarter the wood. 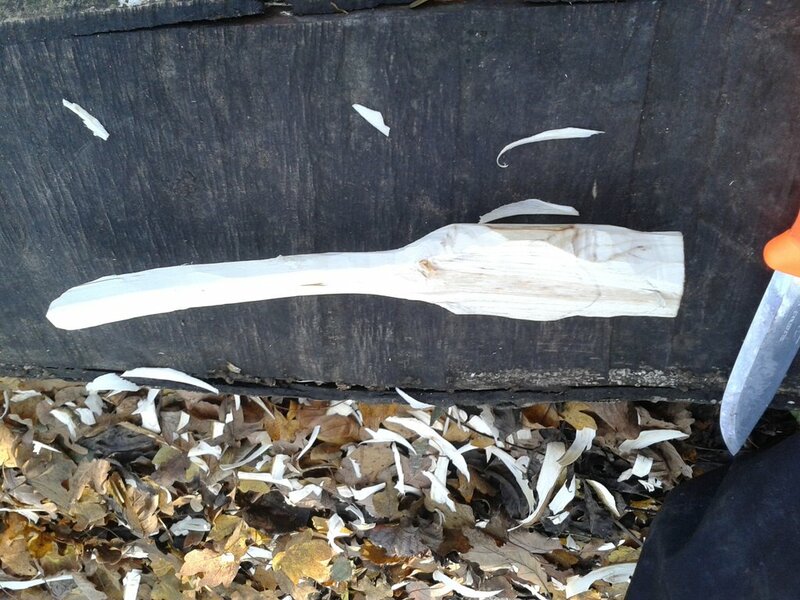 Use a sheath knife to whittle the wood to form a point at one end. It is worth adding a notch or groove at the top to locate the cord that it secures. 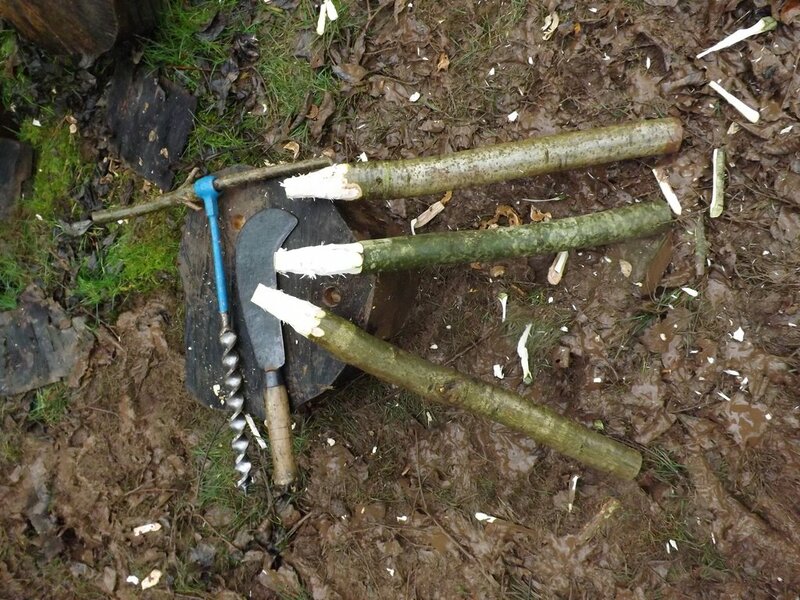 If you plan to reuse the peg then rounding the top can help prevent it from splitting when it is hammered into the ground. 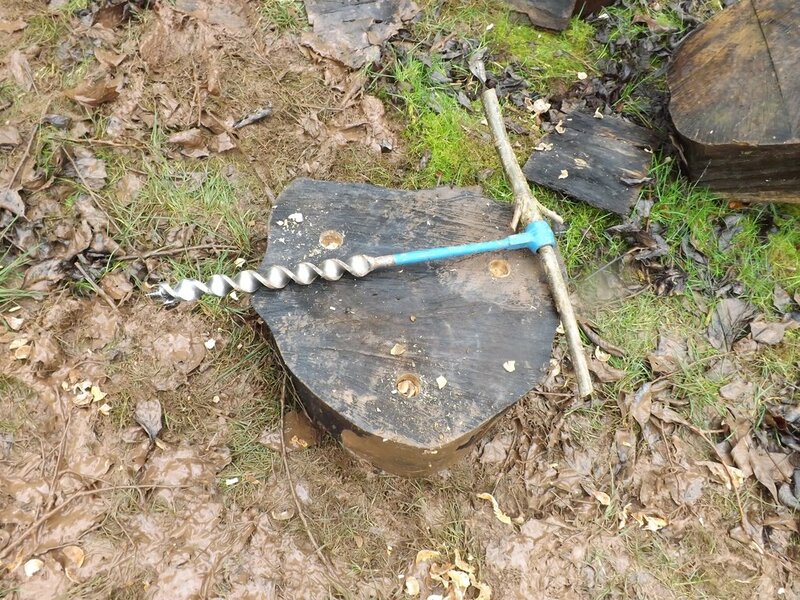 Hammer the peg into the ground at a slight angle away from whatever it is securing. 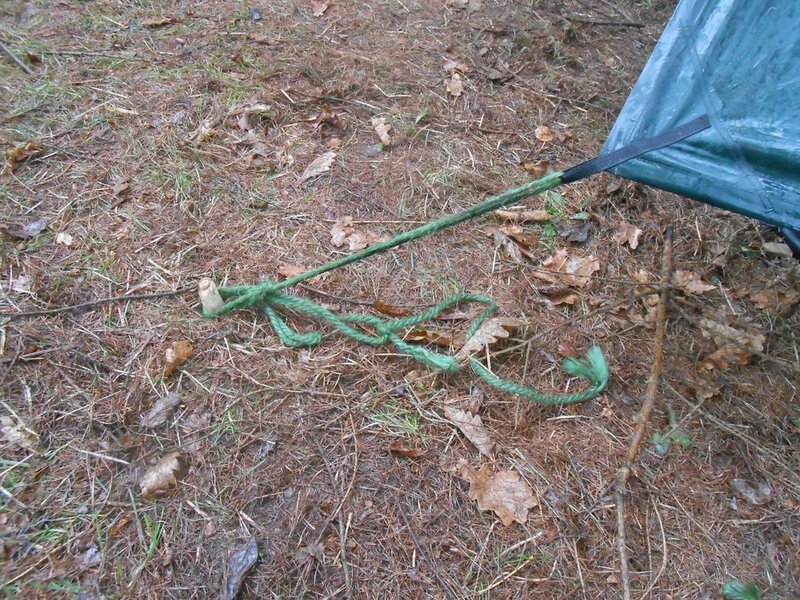 This will limit the chance of the peg being pulled from the ground. 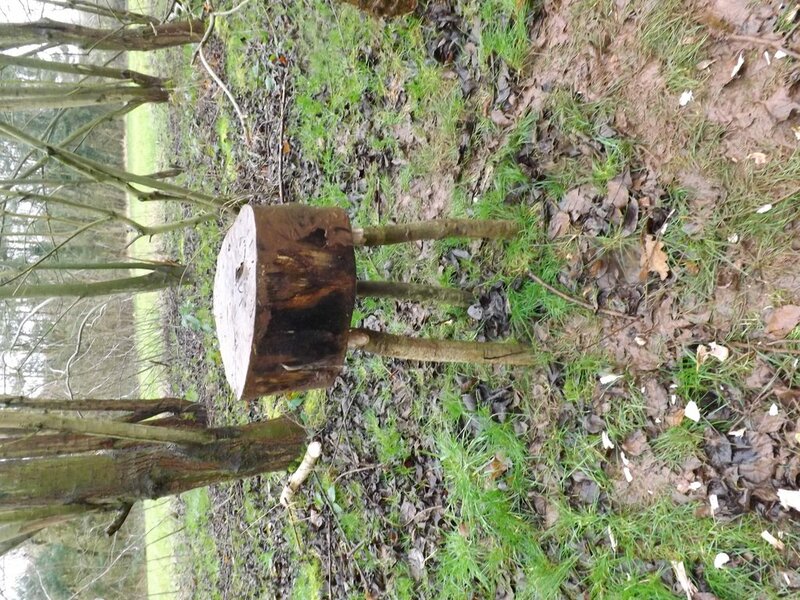 Select a large log to form the stool seat. This one was probably too thick and did make the stool top heavy but was all that was available. Use an auger to drill 3 holes into the base a large log. Use a bow saw to cut three branches of equal length to use as legs for the stool. 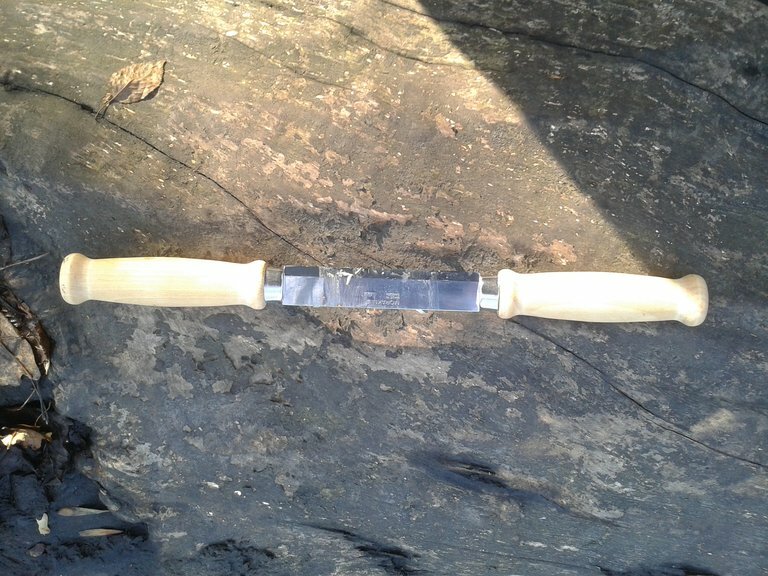 Use a sheath knife to taper the ends of the branches. The narrowest point should just fit in the holes you have drilled. Use a mallet or another branch to hammer the legs into the holes in the seat. Be sure to turn your stool the correct way up before sitting on it. 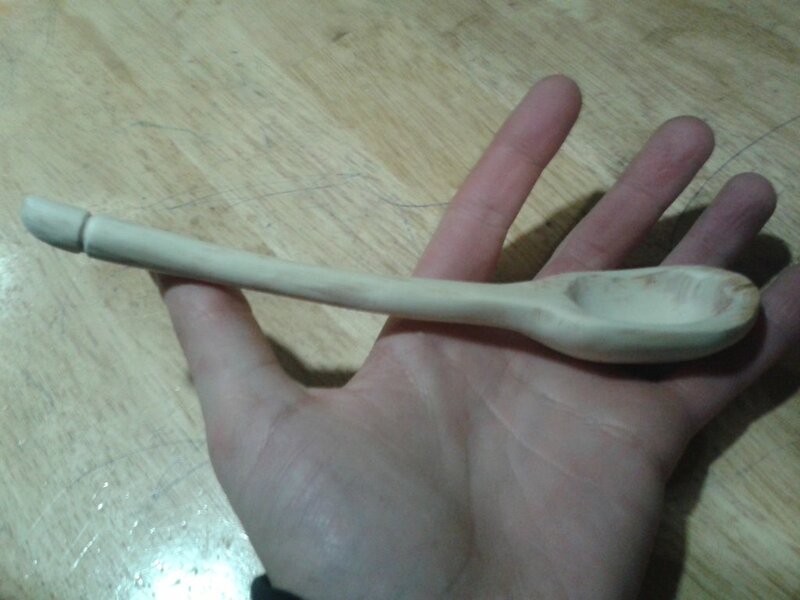 I think spoons are possibly the item I’ve enjoyed making the most. 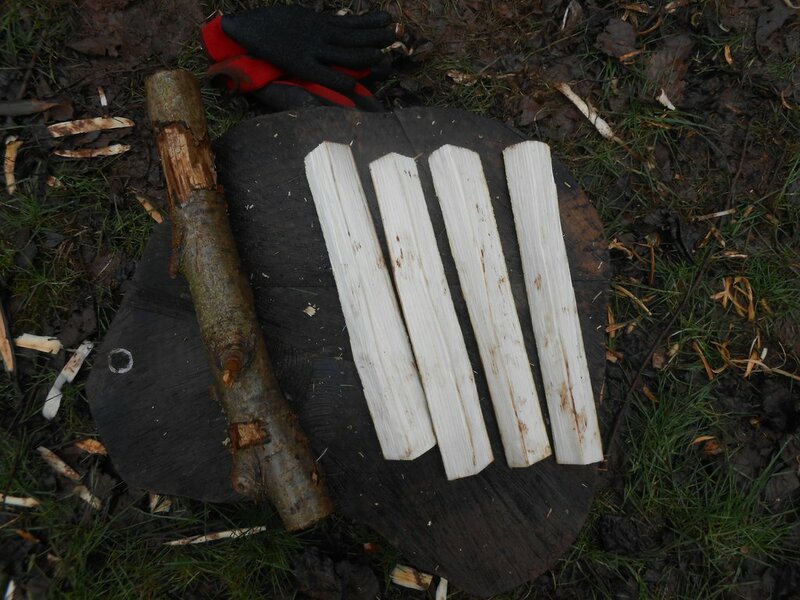 I first had a go making one on a skills day at Manor Farm and have made a number of them since then. Select and cut a branch. The diameter and length will vary depending on the type and size of spoon you want to make. Different woods have different properties, some are easier to carve, some more aesthetic. Be wary of knots as often they can be a hindrance when carving. Sometimes though they can look really nice in the finished spoon. Look as well at the shape of the branch. I like to select ones that are a little off straight so it gives a gentle curve from the handle to the bowl of the spoon. 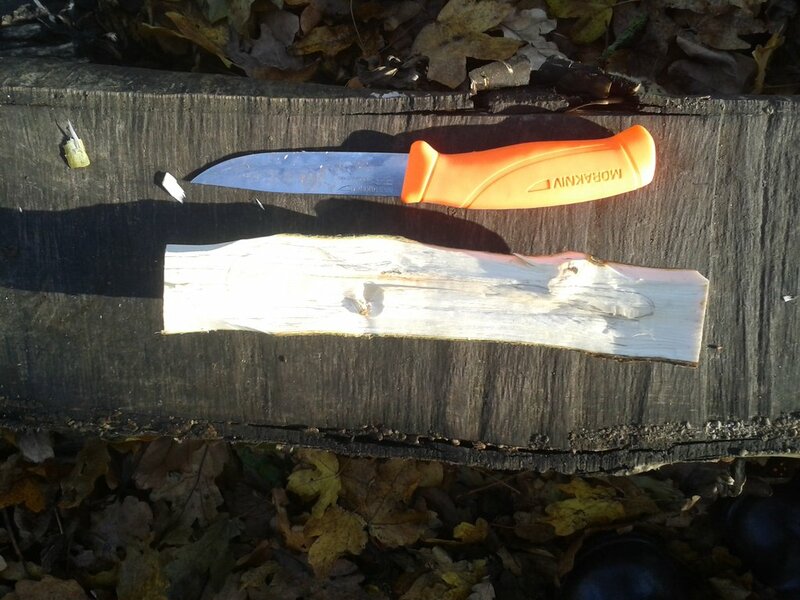 Use a bill hook or splitting knife (shown above) to halve the branch through the pith. Select the half you want to make the spoon from. Depending on the grain and any knots in the wood you may end up splitting several pieces before finding one you are happy with. Use a pencil to draw the outline of the spoon onto the wood as a guide. Begin by stripping the bark and cutting away the excess. You may wish to use a bill hook or small axe for this. It is useful to leave a notch of wood on the end of the bowl to hold when carving the bowl. Once you have the basic shape of the spoon carved use a hook knife to carve out the bowl of the spoon. I have a set of Mora carving knives and a Flexcut hook knife and whilst I have my do find I tend to use a different combination of them on each spoon. Once the bowl is carved out you can remove the notch of wood left on the end of the bowl. Once you have finished carving the spoon use sandpaper to smooth it and remove any marks from the carving. If you have used green wood it may be useful to leave the spoon for a few days to dry before sanding. The spoon can then be treated with oil. I used coconut oil for this one. I was very pleased with this as a first attempt. The only thing I didn’t like was the thickness of the wall of the bowl. I’ve gotten, slowly, braver at making this thinner the more I’ve made. Not every spoon turns out well. Sometimes the shape of the grain, a knot or a slip of the knife result in the spoon being discarded part way through. I’ve enjoyed making them all though and the ones I’ve completed I’ve found are really nice, tactile, pieces of cutlery to use. 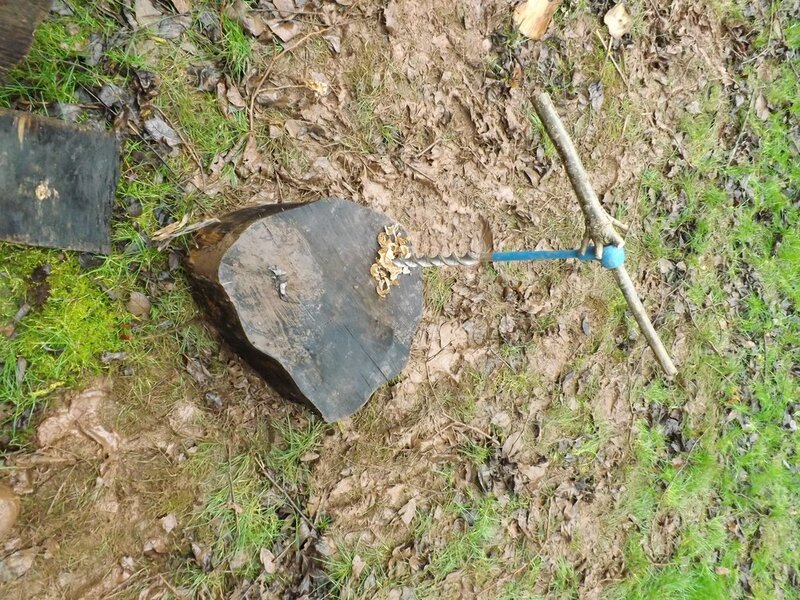 Safe tool use obviously applies for all of the activities above and learners should be appropriately supervised and supported using hand tools. It is important to model the activity alongside the learners. As well as providing additional opportunities to demonstrate the skills involved it gives validity to what you are doing. I have found it is useful to have examples of the item in various stages of completion. Some learners find this very useful to be able to see how there item should look at each stage. I’ve also found it useful to have several different examples of a completed item, including ones that broke or failed during construction. This can help to illustrate that, due to the natural materials used, their items may look different to each others and yours. The broken and failed items can be used to help reinforce the learning process and to limit or prevent self doubt or disengagement if learners find an activity does go as planned.